However, Poland is in no hurry to reciprocate. 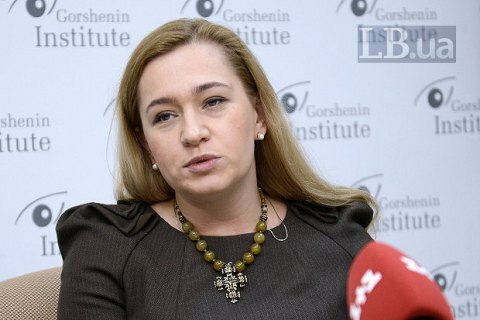 Recent polls showed that despite tensions in Ukrainian-Polish relations last year, Ukrainians have the greatest respect for Poles among all other nations, MP Oksana Yurynets, a co-chair of the group on interparliamentary relations with Poland, told a Friday roundtable in Gorshenin Institute. "Notably, the highest respect and sense of partnership for Poland are in Ukrainian regions that also treasure the memory of the Ukrainian Insurgent Army, UPA, ie in western Ukraine. Attempts by Polish politicians and experts to link the growing popularity of the UPA with anti-Polish sentiments are therefore absolutely groundless," said Yurynets. "When you're sick and miserable, people show you sympathy and help, but when you present yourself as a subject, you will automatically have to play by the rules under which you have to survive, compete and take no offence," she said. "There has always been competition between the countries. For example, Russia introduced sanctions on meat and dairy imports in 2005. There have always been trade wars," added Yurynets. Since Poland refused to support the local Ukrainian community this year, support started coming from the Ukrainian diaspora living in other countries, she said. The Ukrainian community in Canada donated 30,000 dollars to support Ukrainians living in Poland. In early November, Polish officials allowed themselves a series of attacks against Ukraine because of Ukrainian interpretation of historical issues. Polish President Andrzej Duda urged the Ukrainian leadership not to appoint people with "anti-Polish views" to high posts. In particular, Poland was enraged by Ukraine's moratorium on the exhumation of Poles in Ukraine, which came in response to the dismantling of a UPA monument in eastern Poland. Before that, several Ukrainian monuments were desecrated in Poland.